The New Milford High School band and color guard recently competed in the 2007 Musical Arts Conference (MAC) Championships. NMHS took third place in Class 5, scoring 91.65 -- the highest score ever attained by a NMHS marching band in a MAC competition -- and edging out New Jersey champion Ramsey High School by one-tenth of a point. 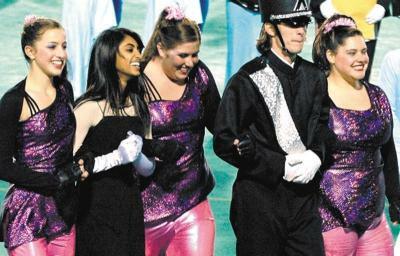 Below, band members, from left to right, Jenna Roberts, drum major Taarika George, Jesse Green, drum major Willie Mandeville and Jordyn Bass, proudly walk onto the field during the competition, while above, the band performs one of its selections. New Milford High School's band and color guard have had a busy season, participating in a number of competitions in Connecticut and, most recently, in Baltimore, Maryland. Those trips wouldn't be possible without the tireless support of the NMHS Band Parents, who provide most of the funding for expenses. 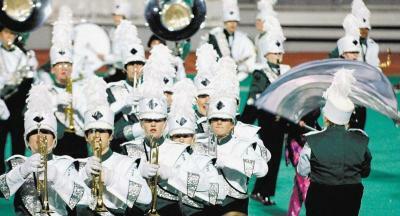 "The band parents pay for everything," said band director Jonathan Grauer. "The parents provide money for buses, instruments, for my staff to travel-they pay for everything that we do. Without them, we wouldn't be able to do anything." Next weekend the band parents are expecting a sellout crowd for Beatlemania, a popular Beatles cover group that has performed nationally and internationally, drawing Beatles music fans to its exciting show that follows the mega-group's career, from the 1960s through the 1970s. The 800 tickets for the Saturday, Nov. 4 show are nearly sold out, according to parent Debbie Faust, who said only about 105 remain. "They're selling very well," she said. "I would be really thrilled if we could go into the high school theater next weekend knowing we were going to have a full house. It's going great. "People love Beatlemania," she added. "They're very popular and they've played all over the world. We're fortunate to have them here." Last weekend, the band and color guard visited Baltimore, Maryland, to participate in a regional championship with nearly 30 other groups, which represented the best of the east coast, Mr. Grauer said. "There were schools from Florida, North Carolina-all over," Mr. Grauer said. "We're pretty sure we didn't make it to the top 10 bands, but it was a great experience for the kids. They were pretty excited and nervous to play in a huge college stadium, and they played really well. Playing on a national level is a great chance for them." In early October, the band and color guard won first place at the Musical Arts Conference at Bethel High School, where they faced bands and color guards from Newtown, Brookfield, Bethel and other state high schools. "It was the first time they came in first place, so that was pretty exciting," Mr. Grauer said. The band also earned honors last winter when it marched in the Gator Bowl in Florida, winning first place in the parade and second place in the field show. In 2005, the students received the Esprit de Corps Award at the Festivals of Music in Montreal. This week the students planned to discuss their next destination-a music festival in Cleveland, where they'd also be able to visit one of the country's largest amusement parks, or a marching competition in Virginia Beach. "The kids who are seniors now went to Virginia Beach as freshmen, so they want to go somewhere different," Mr. Grauer said. "Plus, there's the amusement park. A lot of them want to see that." And next month, NMHS will be represented at a competition at Norwalk High School Nov. 4, and a championship at Central High School's JFK Stadium in Bridgeport. 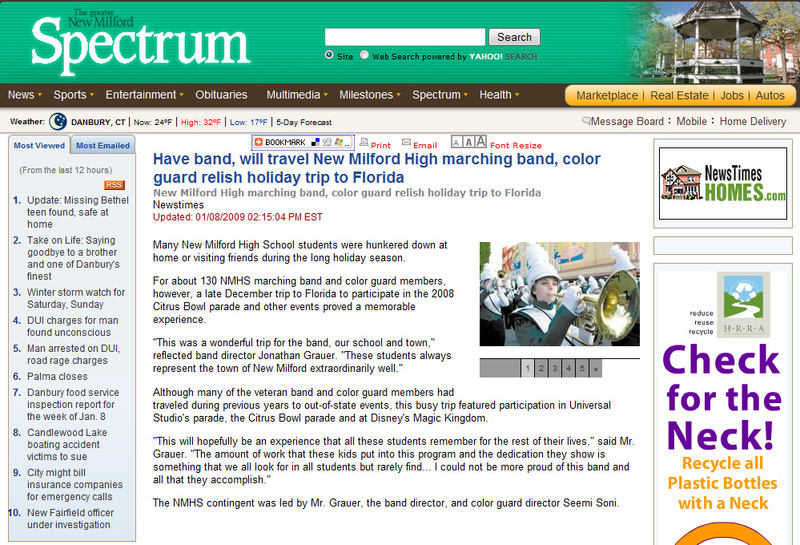 Since he arrived at NMHS four years ago, Mr. Grauer has seen the band's numbers steadily grow. "When I started here, there were about 80 kids, and this year we're up to 162. So we've doubled in size," he said. "They're a great group. I've never had a behavior problem with these guys-never. It's a group that really represents the school well." The Beatlemania concert will be held at the high school theater Saturday, Nov. 4. Doors open at 7 p.m. and the show begins at 8 p.m. Assigned seating is $25 per person. To reserve tickets or for more information, call Debbie Faust at 860-355-9768. On Friday, October 20, the New Milford High School Green Wave Marching Band and Color Guard traveled to Baltimore, Maryland to participate in a regional championship competition. The competition was hosted by Towson University and Bands of America. Twenty-six other bands from all along the east coast also participated. The band’s show, this fall, is titled “Channel One Suite”. The New Milford High School Band is directed by Mr. Jonathan Grauer and the Color Guard is directed by Mr. Jason Ianacone and Ms Seema Soni. One hundred forty-five band and color guard students participated in this event.